The reputation of Volkswagen's new vehicles for handling, performance and road behaviour is well established. Only vehicles of German origin in the majority of the segments where they are found, new Volkswagen vehicles also propose a refinement and an elegance which one does not find in Japanese, Korean or American models. The perfect examples are Volkswagen's new sport utility vehicles starting with the new Volkswagen Tiguan. One of the few compact SUVs to offer an optional third-row seat, the Tiguan is also able to amaze with the driving pleasure it provides and its cutting-edge technologies. You will also find at Complexe Volkswagen 440 a large selection of Volkswagen Atlas, Volkswagen's new mid-size sport utility vehicle. Offering a lot of space and a sophisticated interior, the Volkswagen Atlas is ideal for active families. Complexe Volkswagen 440 also offers a large selection of Volkswagen Touareg, a luxury SUV that is not afraid of off-road trails. In addition to its large selection of sport utility vehicles, Complexe Volkswagen 440 also offers you an extensive inventory of new Volkswagen Jetta and Volkswagen Golf. You will actually find several Jetta and Golf models including Sportwagen, Golf Alltrack, Golf R and Golf GTI. Complex Volkswagen 440 also offers several new Volkswagen Passat inventory as well as many Volkswagen Beetle choices including the Beetle Cabriolet. At Complexe Volkswagen 440, our team of sales representatives always surpasses your expectations in terms of customer service. We will be able to answer all your questions, and you will never feel pressured. 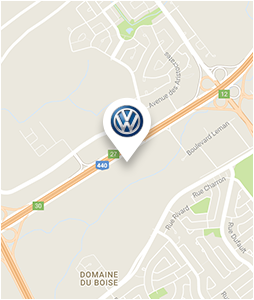 Come in today at Complexe Volkswagen 440 to discover our large selection of new Volkswagen models.